A New Model of the CFU Unit Line Has Been Designed - ! Equipment for Transformer Oil Reclamation. GlobeCore. In December 2014, GlobeCore succeeded in designing a new model for their CFU unit line of equipment. 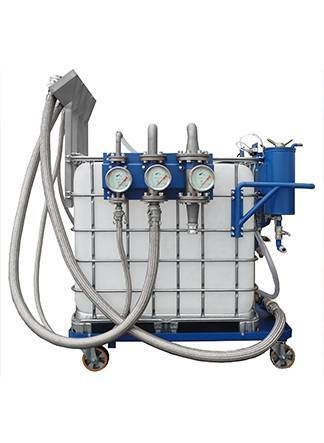 Oil filtration units are best suited for the installation, repair and operating of oil filled equipment. They are designed to remove mechanical impurities from lube oil and industrial oils. This equipment allows for such operations as: (1) oil service life extension; (2) trouble free servicing; and (3) on-site oil processing. Unlike the existing CFU units, the new model is fitted with an additional intermediate container. With the help of this container, used oil may be collected from tanks situated in different parts of the workshop. To meet the customer’s needs, the processing power of the new CFU units has been increased from 160 litres per hour to four square meters (4m3) per hour. Special filters that remove moisture may be mounted into this new model of the CFU units.